The Wildcat Haven (www.wildcathaven.co.uk) is a project in Ardnamurchan and Sunart in the West Highlands, established by the Scottish Wildcat Association in 2008 to conserve the wildcat. It has announced that after five years of intensive planning, trials and fieldwork funded primarily by grants from US foundations, the 250 square mile project region appears free of feral cats and feline diseases. Scottish wildcats form an island population of the European wildcat, isolated for the last 9,000 years and uniquely evolved to Scotland's environment. It is a solitary super-predator that provides a natural control on mammal species such as rabbit, hare and rat. Numbers were reduced through habitat destruction and persecution through the Victorian era and today they are primarily threatened by hybridisation with feral domestic cats, diluting the species into a "hybrid"genepool. 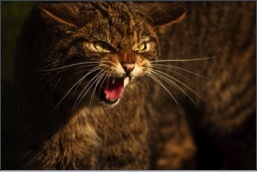 The Scottish Wildcat Association estimated in 2012 that less than 35 pure wildcats survived in Scotland. Cats of any kind are notoriously difficult to survey, however a summer survey turned up nothing and over the last six months project staff have saturated the area with live traps, cameras, vets and ecologists, and had lots of people from the local community out looking as well. The only feral cats seen have already been neutered, which means the population should collapse naturally within the next couple of years. Once verified, this will be the first time feral cats have been removed from such a large mainland area anywhere in the world. Based on a peninsula with a small land bridge, the area is protected by a large, heavily monitored and camera trapped buffer zone at a geographic bottleneck which feral cats cannot migrate past. Further surveys are being carried out and the local community asked to report any sightings, but now the project has its eyes firmly set on the next phase. The project's goal is to establish populations of genetically pure wildcats - protecting anything less than the pure Scottish wildcat will condemn the species to extinction. The behaviour of feral cats and pure wildcats is very different, Scotland's ecology needs the true wildcat and, outside of a wildlife park enclosure, this is the only place in the UK where they are safe from hybridisation. The project has drawn strong support locally, in an area with a remarkable diversity of wildlife where people are greatly concerned that any conservation efforts are carefully planned and rolled out. The project's founder, Steve Piper, claims Wildcat Haven is easily five years ahead of the SNH action plan, and is a practical, affordable, fully field tested way to save the genetically pure Scottish wildcat which has built the support of very diverse stakeholders, possibly the only future the Scottish wildcat has.